You have only limited time to purchase the home products such as kitchen appliances, bathroom products, vacuum cleaners with the prices shown on this ad. Target has a special range of home appliances, particularly for the kitchen. KitchenAid ultra power plus stand mixer will be a device that you will enjoy anytime to make your cake mix. 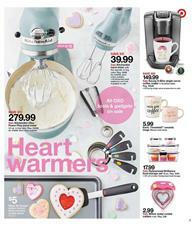 Home products of Target Weekly Ad cover coffee makers, kitchenware and similar products on pg 11. Go to pg 12 for bedroom and bathroom products. Improve the comfort quality to a 5-star hotel level at your home with the premium quality products like Project 62" quilts. Comforter inserts, duvet, sheet sets and more for your bedroom are available in this Target Ad. Until Feb 9th you are able to spend your money wisely using the prices given in this ad. Check out vacuum cleaners for a cheaper price. Shark Navigator, Dirt Devil endura and more vacuums are handheld and powerful devices to clean any corner of your house. There is also a robot vacuum that navigates itself for any kind of disturbance on your floors.